Because finding fascinating WWI letters in an antique shop wasn’t enough by itself, we also went on a hot air balloon ride on Saturday. And because even that wasn’t enough, we had an odd experience, you know, above and beyond the fact that we were in a wicker basked being held up by fire and air, a mile above the countryside. First – the balloon ride itself was lovely. The weather was perfect and the views were gorgeous. In addition to cows, horses, sheep, and goats, we also spotted a deer and a fox, and watched a small plane take off from the local airport and fly below us. The pilot even gave us toy plastic parachutes to throw over board. We also spotted a car accident. We didn’t see the crash occur, but shortly after we took off, we heard sirens. From our vantage point, we could see the lights from the cop cars and the ambulances, and what looked like a car that had run into a wall. We speculated on the nature of the accident. A few people took pictures, including the woman standing next to me (one of the eight strangers sharing the ride with us). She asked me about the zoom on my camera, and whether I could make out any more detail about the accident from my photos. We established her zoom was better, though she still couldn’t see anything. The pilot made an emergency landing. The ground crew picked the woman up, and helped her get to the hospital. Then the pilot took the rest of us back into the sky. The rest of the flight was uneventful, though the pilot seemed shaken. 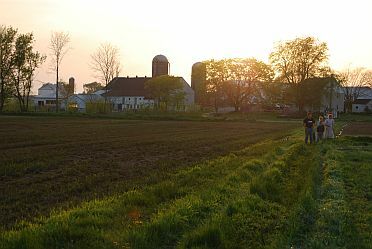 We landed in a farmer’s fresh-cut field at the end of the trip, and two of the boys from the family came out to help pack the balloon away, while other family members and neighbors looked on. The ground crew drove us back to the launch site as the sunset, and gave us champagne. All in all, it was a lovely trip, but also slightly strange. I haven’t seen any news stories about the accident, hopefully that means the woman’s mother is okay. In addition to the two photos below, there’s a whole album here, if you happen to be particularly curious.